I Though the Sun Crusher was pretty cool. 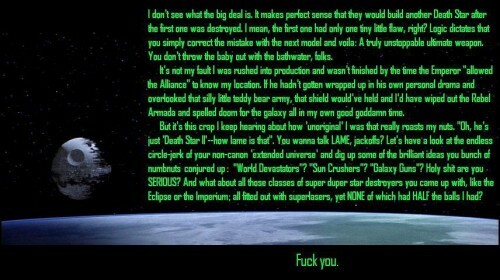 The Death Star is a mean drunk. @tiki god: You must be joking. I started typing a rant about how even the most significant E.U. novels (Splinter of the Minds Eye, Zahn trilogy, Han Solo adventures) were egregiously contradicted in subsequent movies. But what’s the point of the novels being canon when the movies themselves contradict each other? There is no self-consistency, there is no canon, there is no universe. The story that I wrote when I was eight about the Ninja Turtles and Ghostbusters meeting Luke Skywalker was just as canon as anything written by George Lucas. I am about as big a SW geek as there is and i have to say, I like to think in my mind that the books are canon, the movies are fan fare. If anyone else read the books of the movies, you’d see how they changed things to keep them in line with most the other books. Either way, my favorite star wars book is Traitor from the NJO. It is one of the darkest (i mean that in the literature sense, not like the force) in all of the SW stuff. Star Wars, like many other stories/shows/whatevers (like Star Trek), has different levels of canon. The primary canon consists of the movies. Anything not in the movies is not primary canon. Secondary canon consists of the novelizations of the movies. Tertiary canon consists of the EU novels. When there is a conflict in lower canon, the latest material is considered to have priority. So in primary canon, anything not in the movies is ignored, but in tertiary canon, anything in the movies that contradicts a book is ignored.